What images do the words Scottish Irish clans conjure up in your mind? For me its rugged Scottish Highland glens and mountains, perhaps for some others it brings forth images of Ireland. The clan system is centuries old in both countries, and still very much alive, and I might add very relevant in today's society. 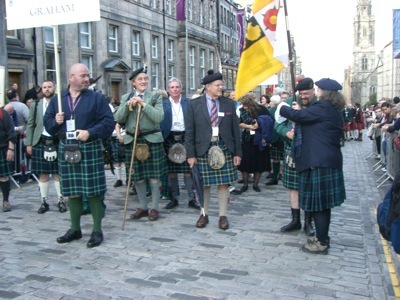 So much so that in 2009 they held The Gathering in Scotland's capital city Edinburgh. 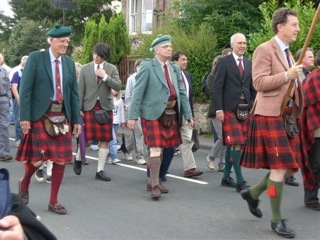 It was attended by thousands of clansmen and women from all over the world, below you can see a photo of the clan McNab marching in a parade during the festivities. And the next photo shows Jim, a regular visitor to this web site, preparing to march with his clan. Jim is standing behind the clan Chief, whom you can recognize by the eagle feather worn in his cap. Jim was the one who kindly sent me the photos from The Gathering. There are numerous Scottish clans, to many for me to attempt to list. But you will notice that I have already begun to write pages on specific clans, and I have no doubt that I will be writing many more as this web-site grows and develops. The first Scottish clan to have its own page on this site is clan Cameron, and by clicking on the text link you can go directly there. The clan chief's photo is featured on the website of a Scottish company www.vfdesigns.com he owns and is wearing one of their sweaters, embroidered with his clan crest. If you would like a luxurious cashmere or lambswool sweater, or cardigan, embroidered with your clan crest, then I highly recommend that you visit the companies website using the link above. Next is the clan MacKinnon, which has been featured because of the great amount of interest shown by the visitors to this site. It has always been my intention to write about what interests the visitors, rather than just write about my own interests. After all the intention of a web-site should be to provide people with the information they want, on the topics that interest them. And of course I could not write pages about clans without writing one on Irish clans, so once again the link takes you directly to it. You can also find a page with a clan map of Scotland, which will give you a good idea which part of Scotland the various clan lands are located. In order to stay updated with all new pages which are yet to be written, may I suggest that you subscribe to the RSS feed, which you can find at the bottom of the navigation bar. And in the meantime if there are any particular Scottish Irish clans that you would like some information on, then please let me know by using the Contact Us page which you can also find on the navigation bar.